It's the little extras ... the accessories that carry the Southwest theme from room to room throughout your home. These decorative switchplates and outlet covers come in every configuration to meet your needs, whether you have toggle or rocker switches. The combo switch is a single toggle with two outlets. 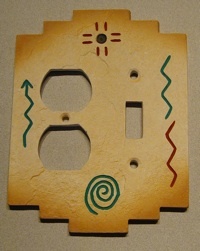 Above is the Painted southwest switchplate cover design with Petroglyph designs. The combination single switch and outlet cover are available in this style. When installing your switchplate and outlet covers, please take care not to overtighten the screws, as the switchplates are made of Gardencast (a ceramic material) and can be somewhat fragile. Be especially careful when installing switchplates on bowed walls. Available southwest switchplate cover types are toggle (the standard switch type with the smaller cutout shown in the inset) or rocker, which is the larger switch type (shown in the photo at the top of the page). Important Note: Minimum order: $40.00. When selecting the number of switches for your switchplate cover, please don't get confused by the numbers on the drop down form. For instance Triple(+6) means that the triple switchplate is $6 more than the base price for the single switchplate. This is how we program our shopping cart. So the (+6) has to do with pricing, rather than with the number of cutouts for the switch. A triple is a triple. We hope this clears up any confusion. "I ordered switchplates from you, and I found the customer service to be excellent!" "Living in Minnesota, there are very few (if any) places to shop for southwestern items. I'm very grateful to have your website as a place to shop. Your e-mails regarding my order are friendly and informative. Thanks!" Order your painted southwest switchplate covers today. Delivery time is approximately 2-3 weeks. Shipped via UPS Ground.